And it’s time for our graduation show! 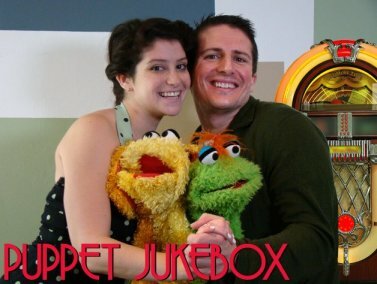 Puppet School proudly presents… Puppet Jukebox! The show will run for four performances from May 26 (Thursday) to May 28 (Saturday). There is one show each of the night, and a matinee on Saturday, where it’s family-friendly with all the curse words cleaned up. (But where’s the punch in that, right?) The show will take place at The Complex – Hollywood. So if you are in the Los Angeles area, come join us for some silly fun! For more details about the show (and to get tickets), click here. To see the Facebook event, click here. PS. Don’t ask me who those people in the picture are. I don’t know either. I believe they are people from the other class, but anyway, we’ll find out after tomorrow’s rehearsal when the two classes meet and rehearse together. Sadly, I won’t be at LA for a couple of days until August, so will keep an eye for another performance by that time. And my blog entries get imported into Facebook. Most local friends probably end up reading it there. While I can’t attend, I will be there is spirit:~) I hope someone videotapes your part…I’d love to see it. Have fun and I hope it all turns out well. Yeah, I’d love to have a video recording of it as well. I am sure that as a performer, I am likely to feel like my part has room for improvement, but I am also sure that it will be fun for the audience nevertheless. I’m on the other side of the country, or I would love to come.